What is Pinterest? It's essentially a virtual bulletin board where you can "pin" things that you find interesting or inspiring. I was given an invite by my sister-in-law a while back and have discovered yet another reason to waste time on the internet! Having said that, I do think that when it comes to concepts for a photo shoot, Pinterest has a purpose. The bride-to-be for my upcoming engagement session, Marcy, is on Pinterest and I have been following her board where she's been pinning wedding ideas. It's been giving me a really nice idea of her style, and what looks appeal to her. Last week, she pinned a photo of a bride on a horse and mentioned how much she loved it. As it happens, she rides, which got us to talking about the possibility of incorporating horses into the photo shoot. 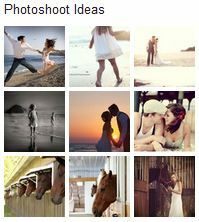 Ever since, we've both been pinning photos of engagement/wedding shoots incorporating horses, stables, farms, etc. Pinterest allows people to leave comments on things that you pin, which also means that I'm able to get her feedback on the things I'm finding. I think it's hugely important that a client feel comfortable with me and know that I'm on the same page when it comes to the end result that they want to achieve. After all, you don't usually get a mulligan when it comes to photographing important events in people's lives. Pinterest is a wonderfully visual way that photographer and client can communicate to share ideas. If you haven't checked it out yet, I highly recommend! I’m happy to announce the beginning of my photo blog. I've been happy to share my photos here for a while now, but figured it was time to bring some other things to the table with this blog as well. Check back for new material and photographic eye candy…there’s much more to come!